The Aliante CNM Compact belongs to the CNM series (where CNM stands for CiNeMa) which consists of a slim floorstanding tower (the already reviewed CNM Tower), a center channel speaker and a subwoofer. The Compact is meant to work as surround speaker inside a complete CNM system or as budget bookshelf loudspeaker of a classic stereophonic HiFi set-up. If you have already read the cited review of the CNM Tower you should be familiar with the solutions used in this series of loudspeakers. Actually, the Compact is - more or less - a Tower with a single woofer and a smaller, freestanding cabinet. So, while the Tower uses an up-firing second woofer, the Compact uses only a single 13 cm woofer unit, traditionally mounted. The Peerless tweeter is exactly the same. The crossover network, as usual on Aliante speakers, is of the limited-slope kind (6 dB/oct) while the internal wiring is, again, made by means of CAT 5 cables (the wire used to build our FFRC and Triple T DIY cables). The magnetic field generated by the woofers is minimized by means of a double magnet. This makes the speakers ready to be used near a TV screen. Since the tweeter uses a much smaller magnet it has been left unshielded. See pic below for details. Exactly like the Tower, even this Compact model uses a front-firing reflex port that should help minimizing interactions with the rear wall. The binding posts are of good quality and allow classical biwiring. The cabinet, thanks to the use of thick MDF panels, is quite sturdy and non-resonant. The reduced size of the panels, with respect to the bigger Tower, helps keeping boominess to negligible amounts. For more details on the manufacturing of the speaker and on the quality of the finish, I suggest you to read the review of the Tower model. These Aliante CNM Compact's have been tested with two different HiFi systems for a couple of months. As said for the Tower's, do not think these are speakers for the Home Theater crowd only. Actually these are traditional bookshelf loudspeakers that can be used even in a full Home Theater environment. Indeed, I'd say these speakers are quite different from their bigger sisters. How is this possible? After all they use the same drivers, right? Clearly, the absence of the second woofer and the smaller cabinet play an almost unexpected role here...as the Compact's show a personality which is quite different from the one I described in the review of the Tower's. The tonal balance of the CNM Compact's, as one may expect considering they belong to the same series, is close to that of the Towers, with less bass weight and extension. With drum'n'bass recordings, for example, one starts to feel something is lacking, though the difference in weight with respect to the floorstanding model is not as noticeable as one may think. The bass range is tight, powerful and, dare I say it, faster than that of the Towers. It may sound obvious, considering both the psychoacoustic effect (less bass = faster sound) and the "braking" effect of a smaller cabinet but it is more than a mere sensation. Bass notes are tighter and faster, attacks and decays crisper...despite the fact some of the body of the instruments is lacking. Let me tell you that with some recordings this tighter bass range is even preferable. Also, I'd add that the transition zone between the bass and the mid-bass regions is smoother and more natural than with the Tower's. For this reason the notes of the electric bass appear free to develop from the lower to the higher one without gaps or audible steps. The mid range, following the usual Aliante way, is open and clear, harmonically rich and sufficiently detailed. Human voices and brasses are always reproduced with lots of presence and tonal precision. The amount of detail, as said, is sufficient and aligned with the standard in this price range. It's hard to ask for more considering the sub-500 price tag. With a little help from...the tweeter these CNM Compact's are able to express a vivid mid-high range, always smooth and sweet. Never too bright or tizzy sounding, these speakers may even appear cloudy, if compared with some overbright competitor in the same price range. Don't let the first audition fool you! Good things conquer your ears (and heart...) after an hour or so of continuous listening. 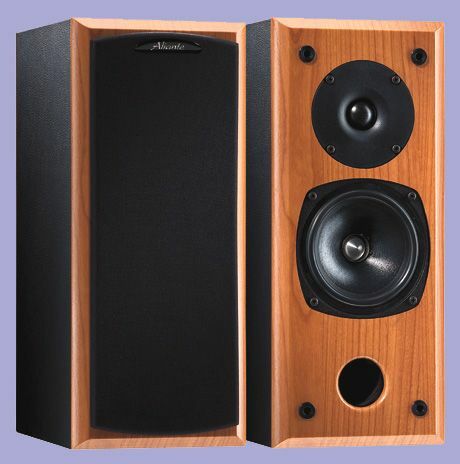 Quick A-B comparisons are the fastest way to choose and then buy an unbearable loudspeaker. Exactly like the bigger CNM Tower's, these Compact's seem to prefer relaxed listening sessions. You can enjoy the Music they reproduce for hours without listening fatigue. Perhaps not the most transparent and detailed around...but definitely enjoyable in the long run. The increased and more accurate sense of rythm becomes self-evident when you try to evaluate the dynamic behaviour of these speakers. They DO sound faster than the Tower's and this helps adding that spark which is needed with the most dynamic musical programs. Though they lack the brute force of the Tower's, their better pace makes almost forget that lack of bass slam. That said, to be 100% honest, I admit that with very complex musical and rythmic patterns the Tower outperforms the Compact, especially - and logically - at high listening levels. These bookshelf speakers can sound loud, if you wish, but they seem to prefer low to mid listening levels and mid-sized listening rooms. This doesn't mean they can't "rock"...they played some AC/DC tune quite decently, indeed, but it seems they feel comfortable with more easy listening Music, light jazz or easy Classical works (not the Carmina Burana thing, thanks). Now you start to understand why the subtitle of this review is Peace at the break of dawn. Just think at yourself staring at the break of dawn, with a gently whispering breeze in your face and silence surrounding you. As I normally choose subtitles for my reviews from song titles or lyrics, I have to tell you where the above comes from, just not to forget what HiFi is all about (Music!). That inspiring phrase opens the song "A Southern sky", from the album Brighter than a thousand suns by Killing Joke [EGCD 66 - EG Records - 1986]. Not exactly an audiophile album...but definitely one of my faves. I LOVE those lyrics. Another main difference between these Compact's and the bigger Tower's can be detected when evaluating the soundstage they create. While the Tower's, thanks to their up-firing second mid-woofer, were able to create an extremely wide and high soundstage, these Compact's seem to prefer to reproduce an impressive depth of the virtual image (one of Aliante's forte's, indeed). Thanks to the smaller size, these speakers tend to disappear quite easily, provided the recording is good enough. The soundstage appears a bit brighter while the focus of the contours of the instruments seems virtually unchanged. All you need to enjoy this realistic soundstage is a pair of good quality speaker stands. Putting the Compact's on a shelf or on wall brackets will seriously affect - dare I say destroy? - their ambience and spatial performance. As said, these are bookshelf loudspeakers, so they should be used with speakers stands. The height of these may range from 55 to 65 cm, depending on the listening room (and chair). Of course, if you plan to use them as surround speakers things may be a little different. The front-firing reflex port minimizes interactions with the rear wall but I wouldn't recommend less than 50 cm of distance from this if you want to keep the tonal balance free from boominess in the bass and harshness in the mids. If you already use a double run of speaker cables you can biwire the Aliante CNM Compact. Otherwise, a single run of a good cable (see, for example, our DIY designs) should be enough. When monowiring, use two small pieces of the same speaker cable to connect the woofer and the tweeter posts, instead of the bad sounding metallic jumpers. Furthermore, be sure to connect the speaker cable to the tweeter posts and THEN, via the wire jumpers, to the woofer posts. This way the mid-high range will sound a bit clearer. The interface between the speaker and the stand can be made via different approaches, depending on your personal taste and the sonic balance you wish to achieve. I mean that some listener may find its favourite "balance" using coupling spikes while another one may prefer decoupling via soft antivibration feet. Trust your ears only. Following an established Aliante tradition, even these CNM COmpact come with a set of felt demi-rings meant to be applied around the tweeters (on the left side of the driver on the right speaker and viceversa). Again, it's a matter of taste, experiment and evaluate their effect on your own and decide. Finally, amp matching. These speakers are an easy load for any amplifier. Their good sensitivity (89 dB) and non-critical impedance (6 ohm nominal, with a minimum at 4 ohm) makes the choice of an amplifier just a matter of taste, provided you choose something of audiophile heritage (NAD, Rotel, AMC, Arcam...). Quality, not quantity, is the key here. Don't forget to break-in the speakers for a while. I'd recommend a minimum of 60 hours to get the best performance. Since this seems a frequent question, let me elaborate a little bit more. Break-in means that the speakers need to be played for a while before reaching their best performance. Just play Music, even (or preferably) at loud listening levels, and you'll hear the speakers improving day by day. That's what break-in is all about. Since these speakers are, from this point of view, identical to the CNM Towers, I'd avoid to repeat once again the same things I've already written. So I suggest you to read the review of the CNM Towers for more comments. I may just add that the binding posts are a bit different and ... equally difficult to use. Aestethically, for what it's worth, I prefer the Towers. Once you've seen these, the Compact model will look like something is "missing". When compared to the Tower model, this Compact will appear as more coherent and balanced. The lack of deep bass and the absence of the second woofer makes the sound a tad more ....compact :-) and coherent, especially to an audiophile's ear. Of course, the real bass is lacking and so is the impact but the overall performance is still quite enjoyable, especially at low listening levels. Needless to say this speaker has been designed to please a large audience (even the Home Theater crowd) so you won't find the typical audiophile bookshelf sound here. For this reason many audiophiles may judge these speakers (both the Tower and the Compact) as too easy-going to completely suit their taste. If you plan to use these speakers in a pure 2-channel system you need to add the cost of a pair of good speaker stands. Hence, the price difference between the Compact and the Tower model becomes smaller. Anyway, this doesn't cause a conflict of interests since the two models - as explained during this review - have different things to offer: the Tower has more bass slam and overall impact while the Compact is faster and more coherent. Up to you to choose.